We can’t leave our Sinclair ZX Spectrum alone. Not only can it do awesome drums (see SpecDrum 2000) and print rude messages about your mates on shiny thermal paper, it can also do RO-BOT VOI-CES! That’s right, we got ourselves a Currah MicroSpeech attachment for the Speccie. This little black plastic box of tricks did for voice synthesis what the SpecDrum did for drum sampling: that is, slotted it right into the back of your home computer. Once the MicroSpeech was installed, every key press you made on the Spectrum’s boingy rubber keys was announced through your TV speaker in glorious, robotic monotone. RUN. EN-TER. SPACE. BREAK. B-B-B-B-BREAK. Being in charge of a talking Spectrum is the next best thing to piloting the Starship Enterprise. Probably. The sound of SpecTalk is 80s sci-fi in a nutshell. MONO-TONE RO-BOT VOI-CES. THE COUNT-DOWN IS COMM-EN-CING. RUN EARTH-LINGS RUN. You know the drill. What’s cooler than that? Nothing, that’s what, which is why we made it for you. Getting musical sounding robotics into a track that needs them turns out to be surprisingly challenging. I’ve spent a lot of time trying and never quite being happy with the result. What I like about this library is that it is extremely lo-fi, which makes it the perfect counterpoint to today’s polished production standards. I need my robot utterances to be a hook, in my songs and these do the trick. Creepy eighties computing gone wild. I got this one as part of the Sweet Freak oddities pack, and I must say it’s fun to use. 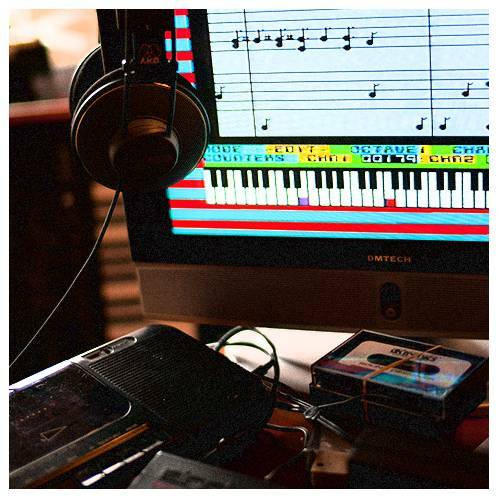 Try to modulate the Tune parameter of its Kontakt instrument to make it sing! Great deal, perfect for intros and outros in your music. 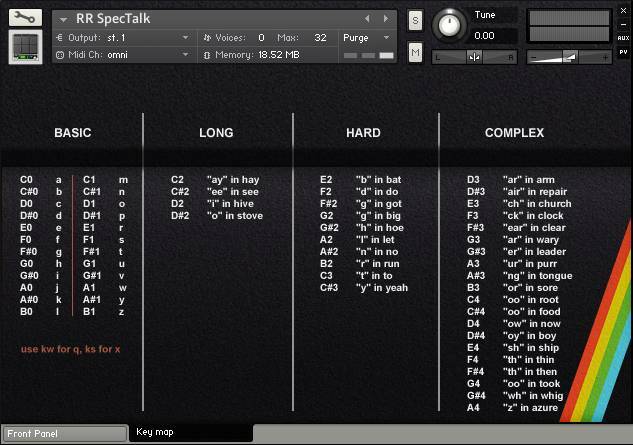 SpecTalk is very versatile because you can easly build every word that you have in mind! 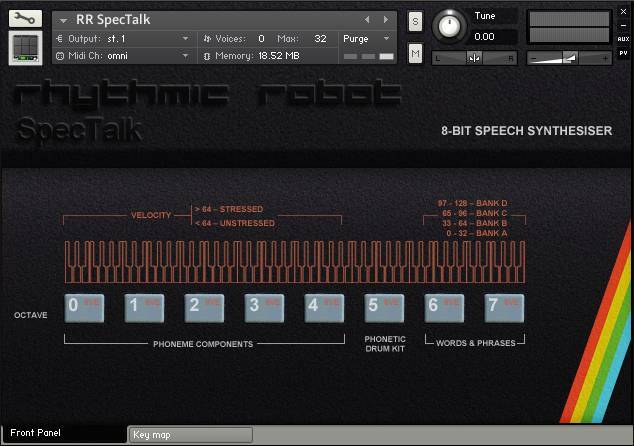 And the vocal timbre of spectrum is more 80s than the classic Speak n Spell and fit very well with E-Mu and other 8 bit samplers. Great for intros/outros, as well as layering under vocals. An absolute bargain at the price, and surprisingly easy to get something that sounds at least a little bit like words out of it. A real lo-fi treat, Sh*tty is pretty! I’m reliving my mispent youth thanks to Rhythmic Robot! You can do some amazing things with SpecTalk, and as you can hear in the demo above, it sounds awesome over a Bad Bad Bass bassline. The reference chart of phonics makes it so easy to program anything you want it to say. This is perfectly made speek-n-spell 80s s**t. Programming words reminds me of the old Vocalwriter. 10 out of 10 best vst ever! If you’ve got time on your hands you can make it say curse words, and if you don’t you can make it sound like someone overdosing on animal tranquilizer. What can I say about SpecTalk other than it brings me back to the good old decade of the 1980’s!! It’s sort of a speak n spell on steroids. I have been using this instrument for a musical composition I’m composing along with samples from NASA space missions and it fits right in! If you’re looking for a way to ‘capture’ a specific sound from a bygone era, then SpecTalk should fit the bill! !